Constitutional Amendments Come In Waves- What Will Ours Bring? I have a piece in US News & World Report about the indispensable Constitutional amendment power through American history, and why we’re due for another round. Article V of the Constitution provides the Amendment mechanism. It is not easy: Approval by 2/3 of Congress (or an unprecedented Constitutional Convention) and ratification by 3/4 of the States. Not easy, yet our national pattern of Constitutional amendment “waves” in times of economic, cultural, political, social and even global shifts is striking. When our politics and society hit particularly difficult stress points, we see not just one Constitutional amendment clear the Article V hurdle, but several at once. The signs are everywhere that we are in one of those times again. In an American tradition that is not required by Article V, over the past three years, huge cross-partisan majorities in more than 600 cities and towns and sixteen states have enacted 28th Amendment resolutions overturn the Supreme Court’s 2010 Citizens United v. Federal Election Commission decision. These resolutions call for Constitutional amendments that will restore the right of the people to decide how best to limit political and campaign spending, and to preserve Constitutional rights for human beings, not corporations. The Democracy For All Amendment was approved by the Senate Judiciary Committee this month, and has 48 sponsors in the Senate, and more than 100 in the House. It would reverse Citizens United and related campaign finance cases by affirming the right of the people through the States and Congress to protect the political equality of all citizens and the integrity of elections and government by regulating contributions and spending in elections, whether by corporations, unions or individuals. The People’s Rights Amendment would reverse the holding in Citizens United and related cases that empowered corporations with the Constitutional rights of human beings, restoring the right of the people through the States and Congress to decide how best to define and regulate corporate entities that are created by the states, the federal government or foreign governments. The People’s Rights Amendment has been introduced in the Senate and the House, and has a growing number of co-sponsors. 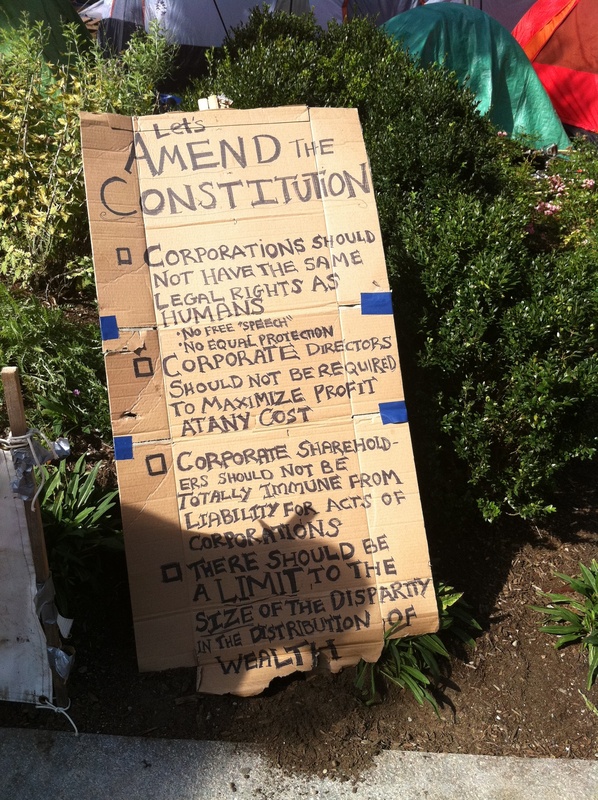 The We the People Amendment reverses Citizens United and combines the elements of the above two amendments. It affirms that Constitutional rights are inherent rights of natural persons, not corporate entities, and the the right of the people through the states and Congress to regulate campaign contributions and spending. The growing national debt has renewed interest in a Balanced Budget Amendment, and the Equal Rights Amendment that fell three states short of ratification is still on the table. No doubt there are more. Of course, not all of these Amendments will win the national consensus it takes to meet the appropriately high bar of Article V. But if our history is any guide, and if Americans still have what it takes for self-government (as I believe we do), it is a good bet that one, and likely more, of these will form the Amendment “wave” that renews our path toward democracy and liberty for all in our time.